The use of High Modulus Synthetic Fiber (HMSF) mooring lines, including Ultra High Molecular Weight Polyethylene (UHMWP) lines continue to make one of the most dangerous evolutions aboard ships safer. A 2017 UK Marine Accident Investigation Branch (MAIB) safety report, however, highlights critical areas where additional engineering review and crew training is required to help ensure overall crew safety. MAIB Report no: 13/2017 dated June 2017, addresses the finding from the March 2, 2015 incident aboard the liquefied natural gas (LNG) tanker Zarga, where the Officer-in-Charge of the forward mooring party suffered severe head injuries when struck by a mooring rope. Specifically, the report found that the officer was injured because he was standing in the snap-back zone of the spring line when it parted. The area where he was standing was designated as a safe area; this was because a thorough snap back assessment had not been carried out by the vessel operator and there was a perception that high modulus polyethylene ropes did not recoil on failure. The report does not state that HMSF Mooring Lines are unstable, but that additional evaluation criteria needs to be employed to help ensure that the proper type of line is chosen and that inspection and monitoring criteria are adequate. It is also important to remember that our diligence in evaluating proper line to use for mooring evolutions is not focused solely on purchasing the correct line, but to monitor it when in use. It is vital to ensure that proper inspections are carried out, including condition-based monitoring and that criteria for removing a line from service are clearly understood by the crew. 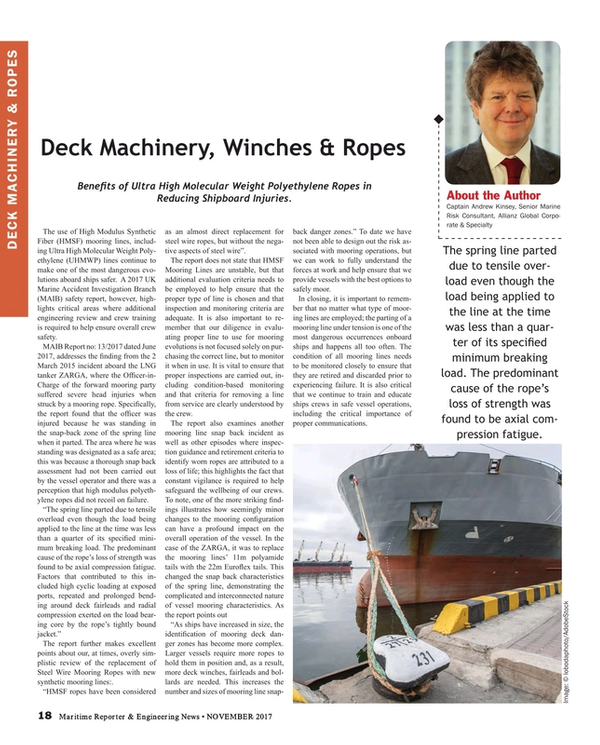 The report also examines another mooring line snap back incident as well as other episodes where inspection guidance and retirement criteria to identify worn ropes are attributed to a loss of life; this highlights the fact that constant vigilance is required to help safeguard the wellbeing of our crews. To note, one of the more striking findings illustrates how seemingly minor changes to the mooring configuration can have a profound impact on the overall operation of the vessel. In the case of the Zarga, it was to replace the mooring lines’ 11m polyamide tails with the 22m Euroflex tails. This changed the snap back characteristics of the spring line, demonstrating the complicated and interconnected nature of vessel mooring characteristics. As the report points out, “As ships have increased in size, the identification of mooring deck danger zones has become more complex. Larger vessels require more ropes to hold them in position and, as a result, more deck winches, fairleads and bollards are needed. This increases the number and sizes of mooring line snap-back danger zones.” To date we have not been able to design out the risk associated with mooring operations, but we can work to fully understand the forces at work and help ensure that we provide vessels with the best options to safely moor. It is important to remember that no matter what type of mooring lines are employed; the parting of a mooring line under tension is one of the most dangerous occurrences onboard ships and happens all too often. The condition of all mooring lines needs to be monitored closely to ensure that they are retired and discarded prior to experiencing failure. It is also critical that we continue to train and educate ships crews in safe vessel operations, including the critical importance of proper communications.